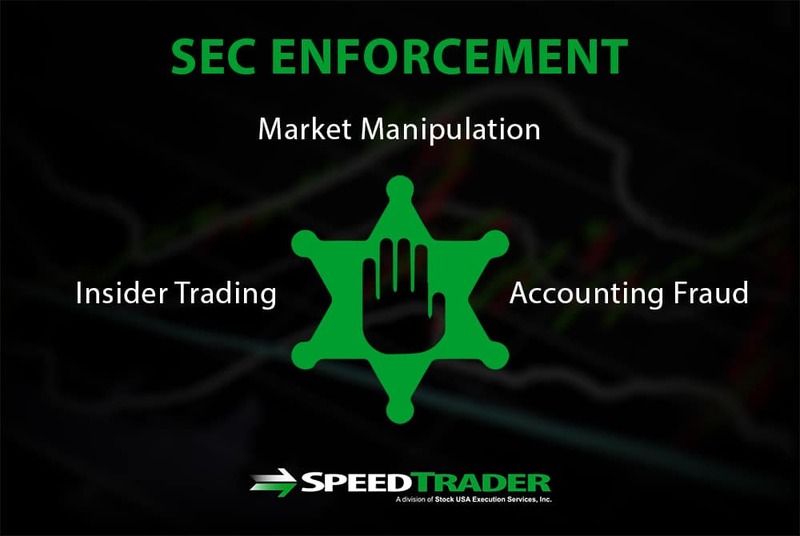 The SEC, the US Securities and Exchange Commission, is the most important regulatory body in stock trading and sets many of the rules on what traders can and cannot do, what financial information companies must disclose, and how stock exchanges function. Nearly all companies issuing public stock and all financial institutions must register with the SEC in order to conduct business, and the SEC maintains the EDGAR (electronic data gathering, analysis, and retrieval) database to provide investors with public-record information about companies’ financial records. The SEC was established by Congress in 1934 as a way to restore consumer confidence in the stock markets after the crashes that led to the Great Depression. 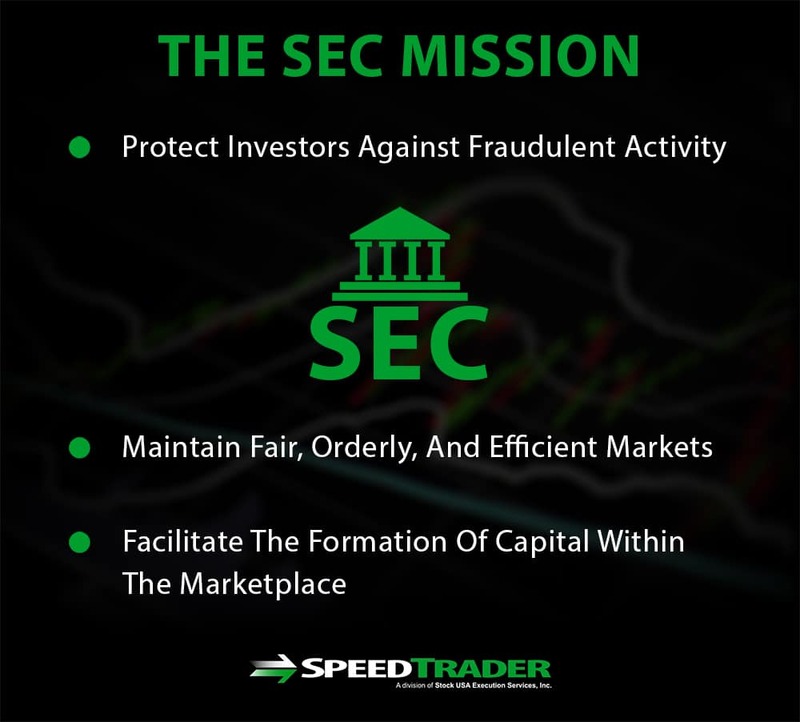 The SEC was tasked with a three-part mission: to protect investors against fraudulent activity, to maintain fair, orderly, and efficient markets, and to facilitate the formation of capital within the marketplace. The SEC has been modified by Congress numerous times since its formation – the most notable recent modifications coming in the Dodd-Frank Wall Street Reform and Consumer Protection Act of 2010 following the 2008 financial crisis – but its fundamental mission has remained unchanged since its inception. Division of Corporate Finance – Ensures that companies provide financial materials to investors to allow them to make investment decisions. Division of Enforcement – Enforces SEC regulations by investigating violations and prosecuting civil suits. Division of Investment Management – Regulates investment companies, investment advisors registered with the federal government, and variable insurance products. Division of Economic and Risk Analysis – Uses macro-scale economics and financial analysis to support the mission and current tasks of the SEC. Division of Trading and Markets – Establishes and maintains regulations surrounding the operation of fair, orderly, and efficient markets. The SEC is headed by a board of five directors, each of whom is appointed by the president and serves a term of five years. No more than three of the directors may be from the same political party in order to ensure the SEC leadership remains non-partisan. The SEC is known as the watchdog of Wall Street because of its role in regulating markets and the way that investors and companies can interact with one another. One of the major aspects of trading that the SEC is responsible for regulating and enforcing are rules regarding insider trading and fraud. The SEC is responsible for ensuring that companies – all interstate companies, not only publicly traded companies – regularly file required financial information that is relevant to investors, and that the information provided is accurate. Furthermore, the SEC is responsible for keeping a regulatory eye on insiders – that is, executive managers within companies – to ensure that illegal insider trading is not taking place within the market. The SEC also oversees investment advisors, as part of their mission to prevent against fraud within the world of securities trading. Another significant aspect of the SEC’s operations is its role in regulating securities markets. This includes setting rules surrounding securities exchanges, brokers, and broker-dealers. The SEC is also the agency responsible for regulating mutual funds, including how the money of public investors can be moved around within and between funds. 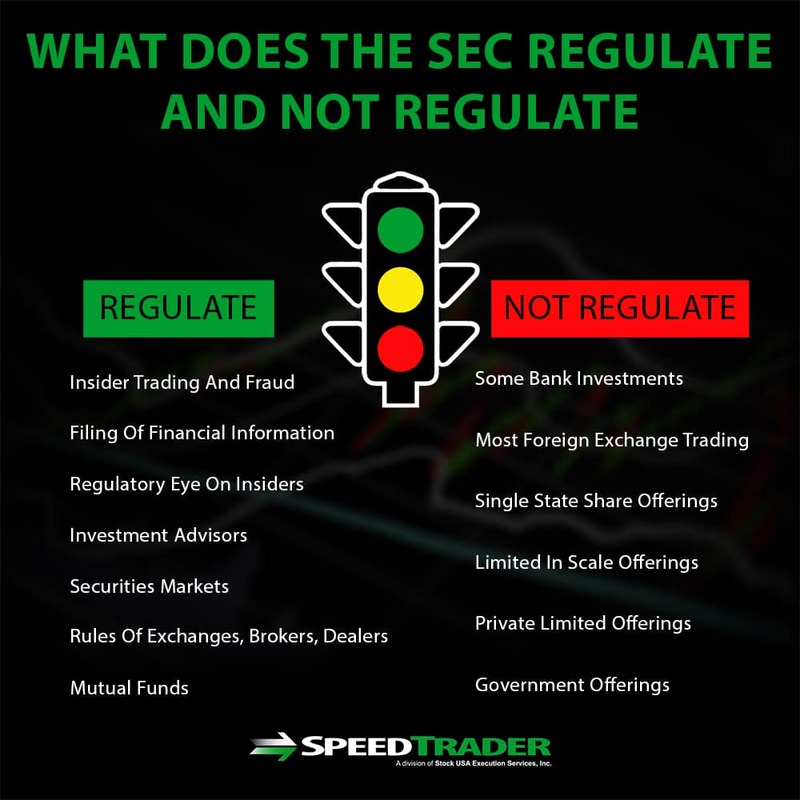 What does the SEC Not Regulate? An important limitation in what the SEC regulates is that the agency primarily deals with securities. This means that some forms of investments offered by banks, such as bank notes, do not come under the regulations of the SEC. In addition, the SEC has little oversight of foreign exchange trading, especially in the case of trading that takes place on over-the-counter markets rather than on central exchanges. The SEC also has several exceptions to its regulations in order to facilitate the development of investment capital. For example, the SEC does not regulate share offerings that are only offered within a single state, offerings that are extremely limited in scale, or private offerings that are only distributed to a small number of investors or institutions. The SEC also does not oversee securities issued by municipal or state governments or by the federal government. The SEC has two primary roles in accordance with its mission: to protect investors and to maintain orderly and efficient markets. Protecting investors and maintaining orderly markets largely comes down to the regulations that the SEC enforces. The SEC ensures that companies and brokers are telling the truth when reporting financial information, that investors are trading on a level playing field, and that complex securities such as mutual funds are handled in the best interests of investors. The SEC also responds to complaints from individual investors – in fact, the majority of investigations that the SEC pursues emanate from evidence brought forward by investors. One of the most common case types that the SEC enforces is insider trading, in which business insiders share information that is likely to affect a stock’s price before it becomes public. The SEC typically pursues around 50 insider trading cases each year against individual investors including hedge fund managers, financial professionals, and corporate executives, as well as against financial institutions. The SEC’s enforcement actions against insider trading can result in barring individuals or institutions from trading as well as in criminal charges. The SEC’s Financial Reporting and Audit group is responsible for pursuing enforcement against accounting fraud, in which financial institutions, fund managers, company executives, or brokers misrepresent their financial activity in regulatory filings. These misrepresentations can have serious consequences for investors, and the SEC’s enforcement actions in this area have led not only to criminal charges but also to the return of money to defrauded investors. Other common enforcement cases that the SEC oversees include market manipulation, for example through pump-and-dump schemes, fraudulent investment advisors, and unfair trading practices by broker-dealers. The SEC is the primary federal agency tasked with regulating securities markets and enforcing these regulations in order to protect investors and ensure that markets operate fairly and smoothly. Although the fundamental mission of the SEC has not changed since its establishment in 1934, the agency continues to keep pace with modern changes as trading technology evolves and new threats reveal themselves, as after the 2008 financial crisis. The SEC is constantly on the lookout for fraudulent financial activity and relies on individual investors to serve as whistleblowers whenever illegal activity is suspected in the marketplace.